Japan’s Defense Ministry explores three scenarios in which Tokyo could come to blows with Beijing. As Japan’s Liberal Democratic Party national defense task force announced on Jan. 8 that it would increase the nation’s defense budget by more than 100 billion yen ($1.15 billion), three of five scenarios explored by the defense ministry recently involve the Self-Defense Forces squaring off against the People’s Liberation Army (PLA). While contingencies involving North Korea’s ballistic missiles and Russia were among the scenarios the defense ministry explored, the top three all involved a crisis in the East China Sea. The first scenario examined a war between China and Japan over the disputed Diaoyu/Senkaku islands in the East China Sea. Earlier on Tuesday Japan summoned the Chinese ambassador in Tokyo for the first time since Shinzo Abe was sworn in as prime minister to protest the continued presence of official Chinese ships in waters around the islets, which are claimed by Japan, Taiwan and China. The second scenario, meanwhile, expands on a Senkaku contingency and looks at a widening war involving PLA attempts to seize the Ishigaki and Miyako Islands west of northern Taiwan. The third, and perhaps most controversial, scenario focuses on how Japan would react to a Chinese invasion of Taiwan in 2021, a date reportedly chosen because it coincides with the 100th anniversary of the founding of the Chinese Communist Party (CCP). According to the scenario, the PLA would rely mostly on amphibious vehicles, special forces, ballistic missiles, and a fighter blockade to achieve its ends. Although the latter scenario makes it clear that the hostilities would primarily involve the PLA and Taiwanese military forces, it nevertheless raises the possibility that China would attack U.S. and Japanese bases on Okinawa, while using long-range ballistic missiles, such as the DF-21D and DF-31, to threaten aircraft carriers in the region and the Western United States should U.S. forces attempt to intervene in the conflict. Interestingly, Japan would have a responsibility to come to Taiwan’s aid in the event the PLA engages Taiwanese forces, the Japanese-language Sankei Shimbun said in its reporting on the scenarios on Jan. 1. There has been much speculation over the years about whether Tokyo would intervene if the PLA ever invaded Taiwan. Reports in 2007 alleged that Japanese and U.S. officials, alarmed by growing Chinese might, were considering a plan to coordinate their actions under such a contingency, with Japan providing rear-area support for U.S. forces as stipulated under the Guidelines for Japan-U.S. Defense Cooperation. It is no coincidence that the efforts in 2007 also occurred when Abe, who is regarded as pro-Taiwan, was in power. The two countries late last year also agreed to negotiate possible changes to the bilateral guidelines to better reflect changes in the strategic situation as well as give Japanese forces more room to maneuver. While the scenarios remain in the realm of speculation, Japan’s inclusion of a Taiwan contingency again underscores the importance Tokyo places on Taiwan remaining de-facto independent. Certainly, China’s assertiveness in 2012 in both the East China and the South China Sea has done little to reassure Tokyo that it could live comfortably with a CCP-controlled Taiwan so close to its waters and territory. As such, rather than being amenable to “abandoning” Taiwan, as a handful of U.S. academics have been arguing for the sake of “improved” ties with Beijing, Tokyo may become more inclined to ensure that the island continues to serve as a natural barrier to Chinese expansion. According to Japanese sources, the largely symbolic 100 billion yen increase in defense spending announced on Jan. 8 will serve to fund research into a new radar system and to cover fuel and other maintenance costs for early-warning aircraft. But this is only the first step, and there could be many more to come. 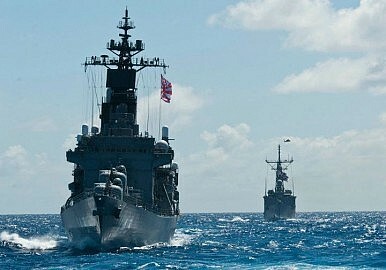 The defense budget for FY2012 ending in March was just 4.69 trillion yen (US$61 billion), or a little more than 1 percent of GDP, leaving ample room for expansion should Japan’s strategic environment continue to deteriorate in the weeks ahead. Tokyo reportedly scrambling its fighter jets at record pace in the face of growing incursions. Japan, China Agree to Implement East China Sea Crisis Management HotlineEast China Sea: China Coast Guard Enters Disputed Waters Following Mattis' Japan TripKuril Islands Dispute: Putin and Abe Once Again Get Serious About Finding a SolutionChina Protests as G7 Ministers Express Concern Regarding East, South China SeasAre Chinese Drones Heading to the East China Sea?